Miller-Fisher syndrome, Guillain-Barree syndrome, Anti-GQ1b antibody, Cognitive impairment, Case report. Miller-Fisher Syndrome (MFS) is considered to be a variant of Guillain-Barree Syndrome (GBS). MFS was first described by Miller-Fisher in 1956 . The typical clinical features of MFS are external ophthalmoplegia, ataxia and areflexia. Antecedent infection is common in MFS patients. Immune response triggered by antecedent infection has been believed to be involved in the pathogenesis of MFS since the discovery of immunoglobulin G (IgG) anti-GQ1b antibodies in 1992 . Anti-GQ1b antibody is an important biomarker for the diagnosis of MFS. A comparative study revealed that anti- GQ1b antibodies were present in 83% of MFS patients . MFS has ‘less-extensive forms’ and ‘massive-extensive forms’. The former could have some incomplete clinical features of classic MFS such as ‘acute ophthalmoparesis’, ‘acute ataxic neuropathy’, ‘acute ptosis’ and ‘acute mydriasis’; while the latter could have additional features such as hypersomnolence (Bickerstaff Brainstem Encephalitis, BBE), Pharyngeal-Cervical-Brachial (PCB) weakness, and limb weakness (an overlap of GBS) . The less and massive forms of MFS with positive anti-GQ1b antibodies have been reported and support that a continuous spectrum exists among these clinical conditions which were referred to ‘anti-GQ1b antibody syndrome’ . Here we report a case of MFS associated with cognitive impairment, which may be a new form of MFS and anti-GQ1b antibody syndrome. A 30-year-old man who was healthy before complained of unstable walking, double vision and numbness of his hands and feet for one day. He felt a little dyspnea, had progressive dizziness and decline of memory, but had no change in consciousness. Before these symptoms occurred, he had a fever, cough and expectoration for one week, but no diarrhea. When he was hospitalized, his body temperature, blood pressure and pulse were normal. The physical examination revealed dysarthria, abnormal eye movements, hyperalgesia of the right foot, areflexia of tendon reflexes, ataxia, and cognitive impairment including decline of memory, calculation, attention, and visuospatial function. The score of Mini-Mental Status Examination (MMSE) was 25. The Blood Gas Analysis (BGA) showed that arterial oxygen tension was 61 mmHg, carbon dioxide tension was 42 mmHg, and arterial oxyhemoglobin saturation (SaO2) was 91%. After oxygen inhalation through nasal catheter, BGA showed that SaO2 was 99%. Cerebral Spinal Fluid (CSF) examination showed normal pressure, protein level and cell count, negative etiological findings (including bacteriological, mycological and viral examinations), and the absence of oligoclonal bands. The stool routine and bacteriological examinations were negative. Anti-GQ1b IgG antibody was positive. Cranial and spinal MRI findings were normal except a rathke cleft cyst (Figure 1). The motor and sensory nerve conduction analysis found no abnormalities. Figure 1: Cranial and spinal MRI findings. A. T1 imaging of cranial MRI: normal except a rathke cleft cyst. B. Enhancing imaging of cranial MRI: normal. 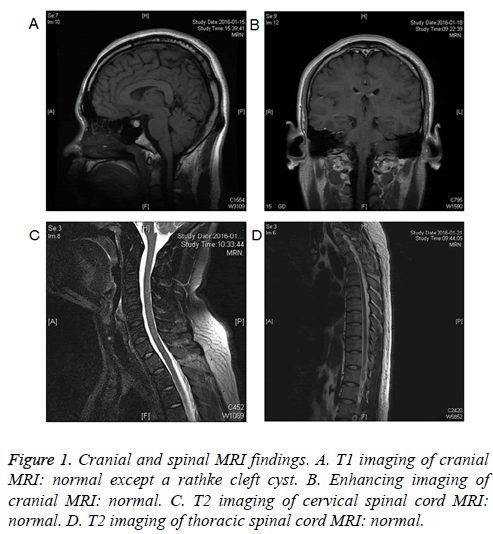 C. T2 imaging of cervical spinal cord MRI: normal. D. T2 imaging of thoracic spinal cord MRI: normal. On admission, we suspected him as Acute Disseminated Encephalomyelitis (ADEM) because of the obvious cognitive impairment. Methyl prednisolone (500 mg) was given daily. On the second day, MRI and CSF examinations showed no abnormality. However, his symptoms were worse. He presented urinary retention, dyspnea and dysphagia, and underwent urinary catheterization. We considered that he had MFS and he received intravenous immunoglobulins (IVIg) for 5 d. The patient improved gradually. On the 7th d, we pulled out the urinary catheterization and he could urinate normally. On the 10th d, all symptoms disappeared. The physical examination was normal. MMSE and Montreal Cognitive Assessment (MoCA) score were both 30 at discharge. BGA was normal without oxygen inhalation. He had no recurrence during 8 months’ follow-up. This patient had ancedent infection, external ophthalmoplegia, ataxia, areflexia, and positive anti-GQ1b IgG antibody. The diagnosis of MFS was confirmed. However, he had cognitive impairment, urinary retention, dyspnea and dysphagia, these symptoms were similar to ADEM but not common in MFS. MFS patient associated with cognitive impairment has not been reported before. Renaud et al. had reported a patient with chronic BBE who had cognitive impairment . BBE is considered to be one of the ‘massive-extensive forms’ of MFS. Thus, we considered that cognitive impairment may be one of the clinical symptoms of MFS but could be overlooked in clinical practice. MFS is a relatively rare clinical condition. There is still controversy on the etiology of MFS. Although most of patients with MFS have normal brain imaging, brain MRI and EEG were abnormal in 1% and 25% MFS patients, respectively . Recently Mao et al. found that MFS could overlap with Acquired Demyelination Syndrome (ADS) in CNS, and MFS/ADS overlap syndromes were more common than other types of GBS . Immunohistochemistry analysis showed that anti-GQ1b antibody reacted with the cytoplasm of neurons throughout the cerebrum, including the cortex and thalamus . PET study showed increased glucose metabolism in the hemispheres of MFS patients . In addition, lesions in bilateral cerebral white matter were found by brain MRI in one MFS/ADS patient . Therefore, the involvement of the supratentorial brain regions in MFS patient is possible. Autopsy findings in one BBE patient with normal brain imaging showed the presence of definite inflammatory changes in the brainstem . In addition, Blood Brain Barrier (BBB) is relatively permeable, and large molecules such as anti-GQ1b antibodies might penetrate to CNS and cause inflammatory changes . These findings indicate that MFS involves CNS and support the central cause of MFS. Inflammatory changes in the cortex or subcortex might cause cognitive impairment in our patient. Methyl prednisolone showed no efficacy in our patient, but IVIg stopped the deterioration and led to complete recovery. This is in accordance with previous reports that the majority of patients with MFS had good outcomes . In conclusion, our case was similar to ADEM but was MFS with positive anti-GQ1b antibody and cognitive impairment. Cognitive impairment may be one of the clinical symptoms of anti-GQ1b antibody syndrome, which has been overlooked. Our case may be a new subtype of anti-GQ1b antibody syndrome. IVIG therapy is effective to stop the deterioration. Fisher M. An unusual variant of acute idiopathic polyneuritis (syndrome of ophthalmoplegia, ataxia and areflexia). N Engl J Med 1956; 255: 57-65. Chiba A, Kusunoki S, Shimizu T, Kanazawa I. Serum IgG antibody to ganglioside GQ1b is a possible marker of Miller Fisher syndrome. Ann Neurol 1992; 31: 677-679. Ito M, Kuwabara S, Odaka M, Misawa S, Koga M, Hirata K, Yuki N. Bickerstaffs brainstem encephalitis and Fisher syndrome form a continuous spectrum: clinical analysis of 581 cases. J Neurol 2008; 255: 674-682. Wakerley BR, Uncini A, Yuki N. GBS Classification Group, GBS Classification Group, Guillain-Barré and Miller Fisher syndromes-new diagnostic classification. Nat Rev Neurol 2014; 10: 537-544. Shahrizaila N, Yuki N. Bickerstaff brainstem encephalitis and Fisher syndrome: anti-GQ1b antibody syndrome. J Neurol Neurosurg Psychiatry 2013; 84: 576-583. Renaud M, Aupy J, Camuset G, Collongues N, Chanson JB, de Seze J, Blanc F. Chronic Bickerstaffs encephalitis with cognitive impairment, a reality? BMC Neurol 2014; 14: 99. Mao Z, Hu X. Clinical characteristics and outcomes of patients with Guillain-Barre and acquired CNS demyelinating overlap syndrome: a cohort study based on a literature review. Neurol Res 2014; 36: 1106-1113. Tuzun E, Kurtuncu M, Lang B, Icoz S, Akman-Demir G, Eraksoy M, Vincent A. Bickerstaffs encephalitis and Miller Fisher syndrome associated with voltage-gated potassium channel and novel anti-neuronal antibodies. Eur J Neurol 2010; 17: 1304-1307. Kim YK, Kim JS, Jeong SH, Park KS, Kim SE, Park SH. Cerebral glucose metabolism in Fisher syndrome. J Neurol Neurosurg Psychiatry 2009; 80: 512-517. Odaka M, Yuki N, Yamada M, Koga M, Takemi T, Hirata K, Kuwabara S. Bickerstaffs brainstem encephalitis: clinical features of 62 cases and a subgroup associated with Guillain-Barré syndrome. Brain 2003; 126: 2279-2290.